I'm looking @ the Whitney cam and looking at your photos (especially the guy in shorts/t-shirt - that's my outfit), and it's hard not to just get in the car and go. LOL. Jace here from Minnesota. I came to Cali to visit a buddy and thought I'd climb Whitney with him. At the last second he backed out on me, but I decided to drive from San Diego and do it by myself anyway. Here's my trip report from 6/7. Got up at 4 AM and met two cool guys from L.A. and hiked the whole way up to the summit. I had microspikes and an ice axe with me and they didn't (I didn't use either the whole way up or down) At the switchbacks there were about two or three "hairy" sections. I hit the switchbacks about 8 o'clock and the cables were a little slick, but just fine. There was another switchback shortly above the cables where we actually had to do a little rock climbing to get above it. The last "bad" spot was right above the chute where there was some ice over a fairly narrow switchback with a big drop. The guys I was with had no trekking pole and I had to give them mine to make sure they were safe. I absolutely recommend trekking poles and I think microspikes, which aren't a must, wouldn't be a bad idea for certain areas. All of these spots were easy enough to navigate with a trekking pole and by mid-afternoon, the way down was very easy because of how soft the snow was. Outside of that, the switchbacks were in perfect shape and despite not getting a chance to acclimate to elevation, I was able to leave San Diego at 5:30 PM on Friday, summit on Saturday at noon, and make it down by 5:30 PM on Saturday. I would definitely not recommend this, but because of my short window in California I had to make it up and down in a day. This was an absolutely breathtaking hike and feel privileged I was able to do it in a day. I want to thank all of you who've posted in this forum. The constant updates on trip conditions really helped me learn this mountain from afar and plan a safe trip with huge success. I hope my report may help others. Snow on the last switchback below the cables and on two switchbacks just above the cables requires focus, but easily dealt with. From Trail Crest to the Keeler Needle, two remaining patches of snow easily passed. Excellent track through diminishing snow field on summit plateau. Spring at 23rd switchback flowing. Many PCT hikers on the Mountain, as well as some hikers finishing the JMT and High Sierra Trail. The trail is in great condition, portal to hut. A lingering patch of snow against the wall at the cables, and a bit more in two of the switchbacks, very firm on our way up, at about 7:30 am, and soft, as expected, on our way back, at about 1:30 pm. There's also a patch of snow on the back side, after the windows, but in my opinion, if you just watch your step, you should be able to walk on it with no special equipment. Beautiful weather, really warm. We only needed a sweater, or a light jacket most of the way up from Trail Camp, but other than that, it was short sleeves and shorts all the way. The night temperature at trail camp couldn't have been below 40,and there was very little wind. The only unfortunate thing was the very high amount of wag bags left over, pretty much everywhere. 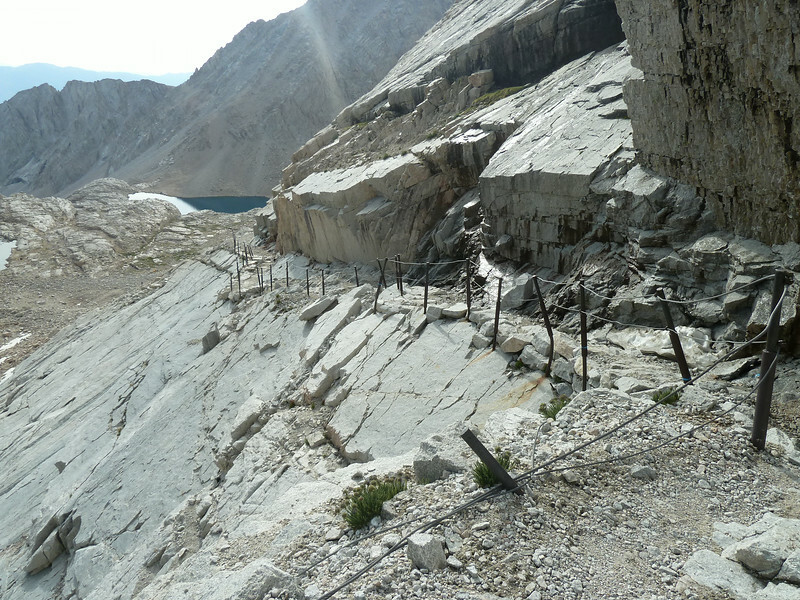 Most of them on Trail Camp, but we saw a few on the switchbacks, and farther up the trail, beyond the JMT junction. Hiked up to Trail Camp on 06/30/14 and the weather was perfect. After setting up our tents, there was a thunderstorm around 3pm. People coming down from the summit said they had hail. We only got heavy rain for approx 15 minutes at the camp. On 07/01/14, we went to the summit. There is only one patch of snow left. No special equipment is needed. Just be smart. It was a hot trail. Used a ton of sunscreen and water. The water source on the switchback is still there and I highly suggest using it. The cables are mostly clear of snow. The snow was melting quickly. I drank a ton of water and ate a lot along the way. This was my first time on Whitney. It was challenging/difficult. If you are planning on going, give yourself a ton of time and when you get tired, rest for a while and don't push yourself too much. Hydrate hydrate hydrate!!! Welcome to the board & thank you for the trip report. Your image should display if you select "using HTML" when you post it. Summer conditions now. Please watch the weather forecasts as that is the biggest issue during August. August came in with a big Monsoon storm that blew up from Baja California. Thunderstorms and snow! It will be back to normal in a few days. Current trail conditions are as good as the weather. All that ice and snow is gone from the trails, so your main concern should be the weather. Conditions have improved greatly since Mon & Tues (Aug 11 & 12). When I left Lone Pine this AM, the skies were clear and there was a slight wind but the weather looked really good. Water flow on 97 switchbacks? I'm looking to refill on 8/27 at roughly 6AM. Has anyone noticed how well the water has been flowing (early part of the switchbacks)? I'd rather skip refilling at trail camp this time. "meganlaughs" reported that the spring is still running on the switchbacks. She spent a long time filling at Trail Camp, though, since it was 3 AM and she wasn't sure whether the spring would be frozen at that time. We are starting our hike this weekend through Horseshoe Meadows with the hope of summiting on Wednesday. What are the ice/ snow conditions like on Whitney trail right now? Concerned about whether we need to rent some crampons or not. Thanks! Usually if it is iced over I can find a spot to tap through. Thanks to you both --- "meganlaughs" and Steve! Shawna, don't rent crampons. Any remnant ice will be minor. Please do report back here: The condition of the "spring" at Switchback 23 -- is it running enough for hikers to get any water? This is the time of year that it can dry up, since it is actually melt-water from a snow field farther up on the slope. As of the evening of the 21st there wasn't any ice on the main trail, period. I passed a rapidly melting fist-sized chunk at the cables that may literally have been the last piece. I have seen recent reports that the spring at switchback 22 is nearly dry. I would advise people to get their last water at the inlet to the Trail Camp pond. 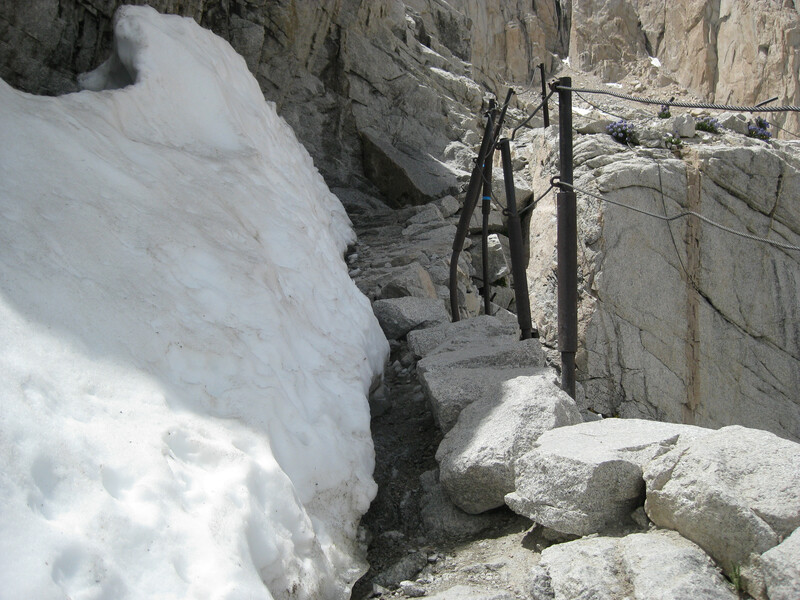 Ice is beginning to form along the cables due to the seeping water and cold nights. Weather has been pretty nice, though today (Sept 7) clouds and a light sprinkling has passed through Fresno, so thunderstorms will occur in the Sierra. Watch the weather forecasts closely. First snow storms can come near the end of September and beginning of October. With temperatures in the 90's for this Wednesday and Thursday is it still ok to hike? I have a permit for this Thursday the 11th, is there anyone or a group I could join? Thanks! Generated in 0.223 seconds in which 0.212 seconds were spent on a total of 15 queries. Zlib compression disabled.